Can You Hook Up Game Consoles to a Cable Box? Having a gaming console and no free audio/video input ports on the back of your TV is like having cookies with no milk. Your console is just an expensive paper weight if you can't plug it in and play. Whether you can plug it into your cable box depends entirely on the box itself, and whether it has the proper AV input ports. Even if it doesn't, there are a few other options to consider before throwing in the towel. First, look at your cable box. While connection ports are typically on the back of the unit, they may be on the sides or front. Feel along the front of the box for a lip you can pull down, seeing if it exposes any AV input ports. Since you're sending the signal from your gaming console to the cable box, you need ports labeled "IN" or "Input," not "OUT," or "Output." Classic gaming consoles, like the original Nintendo Entertainment System or Super Nintendo, have RF outputs instead of color-coded composite cables. The console's RF cable usually has an RF switch, containing an additional input to plug your cable box into before leading both to your TV through the switch. As of August 2011, modern gaming consoles come standard with composite connection cables, as well as possibly some higher-quality options like HDMI or component connection. 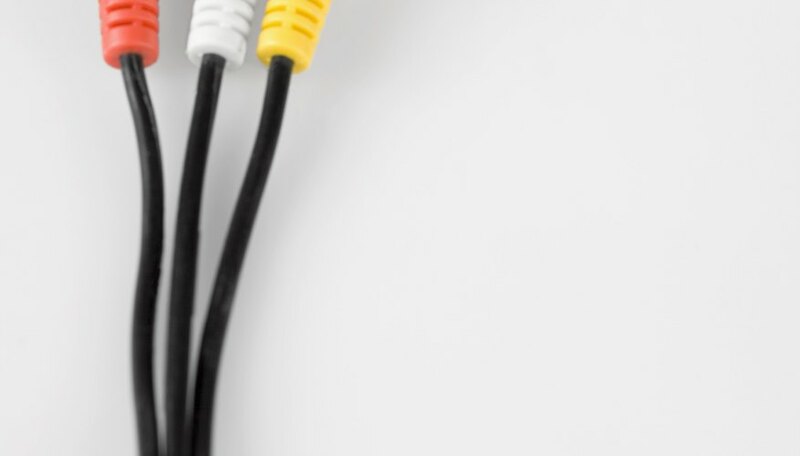 Component inputs are similar enough to standard white, red and yellow composite inputs that they can be used if no composite inputs are available on your cable box. Plug the white and red audio cords into their like-colored composite input ports, and plug the yellow video cable into the green composite port, usually labeled either "Video" or "Y." If you're using your TV's only set of AV input ports for another device, like a DVD player or DVR, you may be able to connect the gaming console to that device. Just like with the cable box, examine the device for any AV input ports. If ports are available, plug the console into the device, then run the device to your TV. With this method, the device may need to be turned on before playing your video games. Older TVs may not even have standard composite input ports. If this sounds familiar and you're still not connected, it may be time to consider an RF adapter or modulator. Found online or at an electronics store, these adapters serve as a hub to plug multiple devices into your TV's single RF coaxial input. Look for one with both RF coaxial input and composite AV input ports, letting you plug both your cable box and gaming console into this one adapter.